“To understand how to define the issue, find out what level of government can have the biggest impact on it, where should you go with this problem. Lastly, how to best approach that body and make your case - but that takes some knowledge and experience to get that far,” she says. O’Connor advocates an analytical approach to an understanding of government that includes defining the problem or issue, identifying the government entity that is best able to address it, then determining a course of citizen action to effect change. Identifying the problem, she says, is the first step toward change. O’Connor was in Atlanta to address the Education Commission of the States and promote awareness for her project, iCivics. iCivics aims to generate civic interest and knowledge among young people and is available to all teachers, free of charge. 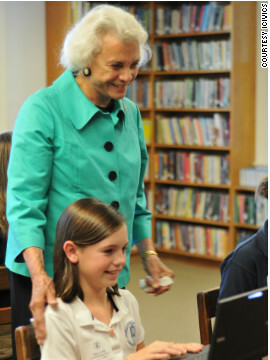 Retired U.S. Supreme Court Justice Sandra Day O'Connor helps a student learn as she plays a game on iCivics. Students can play games and simulations on iCivics focusing on each of the three branches of government as well as individual rights and responsibilities. For example, students can test their powers of persuasion in “Argument Wars” as they argue cases before the Supreme Court. They can run for president in “Win the White House” while they learn about real campaigning, including raising funds, polling voters and crafting media campaigns. In “Immigration Nation,” students can guide newcomers through the path to citizenship. The games are engaging and offer some opportunities for critical thinking. All the while, students are learning about the Constitution and the branches of government. There are about 70 lesson plans available for teachers, in addition to the games. O’Connor and her team launched iCivics in 2009. She’s extremely proud of the site, and says teachers and students are “raving” about it. O’Connor says she has always been interested in public service and wants to see young people engaged in it, too. But in an age of social media and lots of distractions, what advice does she offer to parents who want their kids to be interested in civic participation and current events? “Encourage kids to be involved in projects that get them to interact at some government level,” she told CNN. The only lessons people are learning about politics is that they don't want any part of it. It's a game of distortion and corruption at all levels, and I can only imagine how ugly the behind the scenes stuff really gets. As long as people like Karl Rove are involved in politics there will never be any sense of community or compromise. Realizing what she brought into the world, Rove's mother committed suicide. 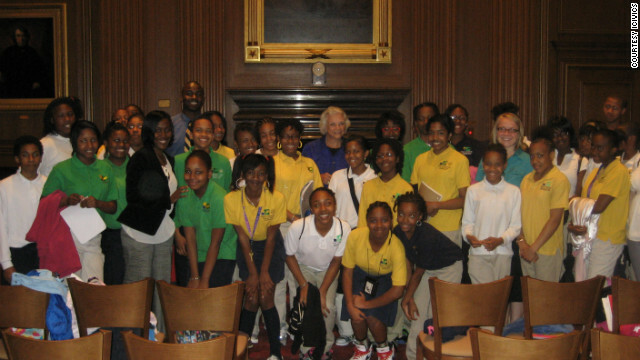 The O’Connor champion civics education program is inspirational. I support her job and think she will give and constructive award of his nation throughout the civics education program. Thanks! Thank you for your continued service, Justice O'Connor. I think that if our citizens grew up being educated about how our government works, we could move back toward a spirit of comprimise, rather than the armed camps we have now.